Asphalt pavement is a mixture of stone, sand, and asphaltic binder, with the bituminous material comprising between 4% and 0% of the total. Most asphalts are mixed, heated, and blended in a batch plant. The asphalt is then hauled and spread to a uniform depth and rolled until compacted. The process of deterioration begins as soon as the asphalt is put down. In normal conditions, after 3 to 5 years major deterioration is taking place. oxidation (sunlight) is causing asphalt to turn gray and brittle, resulting in cracking. water is entering cracks, freezing during the freeze/thaw cycle, and causing larger cracks and potholes. rain is entering cracks and causing base damage. washer. Remember a good sealcoating job is 95% surface preparation. The asphalt pavement must be cured, firm, and sound, prior to sealing. There are some simple tests which can be used to determine whether the pavement is cured and firm. Pour some clean water on the surface of the asphalt; if an oily film appears in the water, the pavement is not sufficiently cured. For firmness, press a screwdriver onto the asphalt surface; if the screwdriver easily makes a depression, then the surface is not set firm enough. The length of time for curing of an asphalt pavement will vary according to the mixes used and the compaction of the asphalt. This can vary from 30 to 60 days. It will be necessary for the applicator to learn what types of mixes and meth- ods of compaction were used on new pavements. From this, a proper judgment can be made as to how long to wait before sealing a new pavement. If the size of the stone increases and heavier, compaction is employed, the pavement will be ready for sealing sooner. This general rule applies to a plant mix type asphalt pavement. A pavement which is made of cold mix, or by shooting and chipping, will take one to two years before it is cured sufficiently to seal with a coal tar emulsion. Blocking off of pavement should be accomplished with as many bulky items as possible. Then twine should be stretched between the barricades at a height of 28 to 32 inches from the ground. Flags can be tied to the twine to make it more visible. Blocking cones can be used, but are not as effective unless a great number of the large variety are used. People generally know they can drive over them or between them. The cleaning and preparation of the pavement is a most important function for getting good applications. When the repairs are complete, the pavement must be cleaned of all oily substances and all dirt. The oil and grease spots must be cleaned and scraped to remove as much of this material as possible. These spots should be then treated with oil spot primer and brushed into the effected area and allowed to dry. Then the entire area must be clean of all dirt. This can be accomplished by the use of the air broom. The air broom should be operated to blow dirt from the wind; however, try to blow the dirt away from the buildings, traffic, and pedestrians. On large jobs, start in the area where you plan to seal first and continue in a systematic manner across the pavement. Areas will be encountered where dirt and silt are stuck tight to the surface. These will be around the perimeter of the pavement and in areas where water stands. Use the wire broom to brush away these areas while the air broom blows away the dirt. If the loose material begins to build up, remove this with a scoop shovel and the cleaning will go along more quickly. If any areas appear to have silt embedded in the pavement that cannot be blown and brushed off, these should be cleaned with water pressure. All growth dug loose from the edges of the pavement (dirt and stone) should be hauled away or deposited in the owner’s trash container (with the owners permission of course). Wet spots can be dried with the help of the air broom, or by brushing the water around with a street broom. By spreading the water around in this manner, it will dry more quickly. Below are general guidelines for applying sealer based on a typical application scenario. Dry to touch: 30 minutes to I hour. Between coats: The first coat must not only dry, but also cure sufficiently to prevent pickup before the second coat is applied. Shady or sheltered areas may require a longer drying time. Allow at least 2 hours between coats on residential driveways so as to minimize pickup or tracking. All manufacturers recommend 24 hours between coats or before opening to traffic. Methods of application: Apply sealer with a brush in the trimming areas. For the most efficient sealing job possible use a spray sealing applicator capable of mixing and blending, with an agitator, sealer, and sand. Directions for application: Mix until the sealer is of uniform consistency. Mechanical mixing is recommended and will lessen time in obtaining uniform consistency. Do not apply when temperature is expected to drop below 50 degrees F., or if rain threatens before the sealer is cured. Application is recommended early in the day or when at least 2 hours of sunlight remain upon completion of the job. Thick coats will not cure readily and could result in pickup and tracking. After the first coat is cured, apply second coat so that all pores are sealed. To determine whether the first coat is cured sufficiently, use the thumb test. At various locations and while exerting approximately 10 pounds of pressure, twist thumbprint 90 degrees. Lack of pickup on thumb indicates sufficient curing of the first coat, and indicates you should be able to continue with your second coat. The sealer and sand must be mixed in machine while applying sealer to insure an even distribution of sand over the sealed area, Best results are obtained when the sand slurry coat is applied in both coats equally. 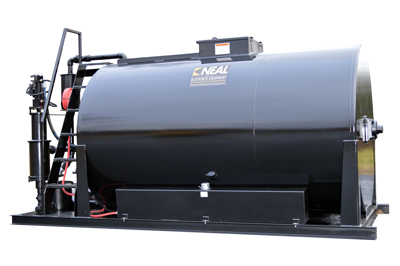 The sand slurry coats can be applied more efficiently and evenly by a spray application designed and developed by Neal Mfg. Co., Inc. This is an outline of the steps on the application process and not specific instructions for each procedure. We will deal with that elsewhere. Also note that all crack filling should be done a week prior to sealing when using cold pours. Most manufacturers recommend a minimum of 60 days curing time. Keep relative humidity in mind when determining the amount of water that should be added to the mix. RULE: If humidity is high, add less water. Longer passes with the applicator will make a better finished appearance. Keep sealer off adjacent concrete surfaces; mask them off if necessary. Between coats, put away unnecessary tools and always keep applicators clean. Complete work orders promptly and keep account of material application rate. Workers should know their job and be able to speak intelligently about what is being done. They should always be neat appearing and alert to perform their task. 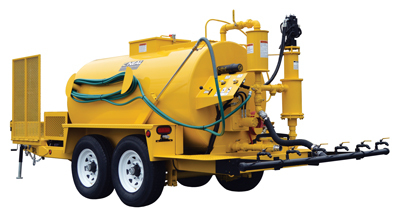 Keep truck on cleaned pavement once you start application. Consider sealing an area where you will end the first coat to set the truck on while you wait to start the second coat. Never run the truck over partially dried material. Don’t block your equipment in on job completion. 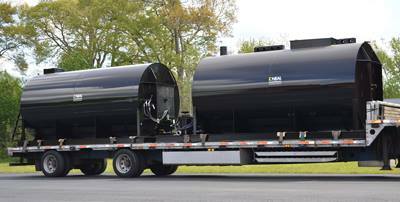 Fill truck with gas and material at end of day. The first rule to follow is, whenever possible, wash all tools and equipment used on application with water immediately following their use. If you can rinse these tools before the sealer dries they will wash up cleanly and easily. Ideally a container (a 22 gallon drum is ideal) with water, you can wash the tools and filter, is recommended.